Three Man is a classic dice drinking game that everyone should try at least once. This game takes practically no setup so just gather your friends around a table, grab some beer and a dice to get ready for a fun night ahead. Everyone sits in a circle with a beer. First, you need to determine who is going to be the Three Man. This is done by each person taking turns rolling the dice. The first person to roll a three becomes the Three Man. The game then proceeds around the circle with people taking turns rolling the two dice. The dice are only passed when someone rolls something that does not require drinking. A person can have to drink for a number of reasons, these are considered penalties. Also, the Three Man can be told to drink at anytime except by the person who is rolling. If the roller trying to tell the Three Man to drink then they must drink. The first penalty is if a three is rolled by a regular player then the three man must drink but if the Three Man rolls a three then he may pass the title of the Three Man to a person of his choosing. If a seven is rolled the person to the right of the roller must drink. If a nine is rolled the person across from the roller must drink. When a ten is rolled everyone has to drink and if a eleven is rolled the person to the left of the roller must drink. There are a few other penalties based on combinations of the dice being rolled. If someone rolls a four and a one then they become the Thumbmaster. They can place their thumb on the table whenever they want. The last person to do this must drink. The Thumbmaster can only change when someone else rolls a four and a one. Also, whenever someone rolls doubles they give the dice to someone of their choosing. This person rolls the dice and must drink for that many seconds. 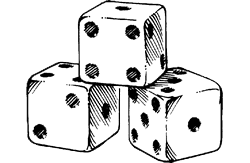 The dice may be given to two people instead of giving both to just one person.